When I released my textbook in December, I offered 25¢ for each typo or other mistake found in the book. I expected, based on how much material was new, to have about 50 typos in the book. My students have already found 42 errors, and they are only up to about page 200, so I’m having to revise my error estimate upward to about 100 errors. This year’s class seems to be pretty sharp—they have done much better on the first two quizzes than last year’s class did, and in two weeks they have already found about as many typos as last year’s class did over two quarters. I’ve released a new version of the textbook Applied Electronics for Bioengineers, on the LeanPub website: https://leanpub.com/applied_electronics_for_bioengineers and sent the students registered for the course a coupon to get their free copy. People who have previously bought the book (even if for $0 with a coupon) were also informed of the release, so that they could pick up a new copy. This version is 481 pages including 38 chapters, preface, appendices, and index. There are 10 tables and 199 figures (239 distinct images, since some figures have multiple subfigures). I added a lot of new tutorial material, fixed some errors (including some serious ones), added more exercises, and modified the labs to use the Analog Discovery 2 USB oscilloscopes rather than the expensive bench equipment we used to use. The book is not “done”—I still have over 50 to-do notes in the margins, but I believe it is significantly improved over last year. Improvements would be faster if students would tell me when they find errors or confusing writing, but they rarely do, and I have to guess what needs fixing from mistakes they make weeks later. The use of the Analog Discovery 2 enabled me to offer a larger course this year—I managed to equip a 25-station lab for 50 students for under $10,000—less than the cost of a single station in the old lab. Because the space I’m using for the two 50-student sections is used as a classroom by other courses, I need to wheel everything in on a cart 20 minutes before labs start and clean it up and pack it away after the labs. recording the serial numbers and setting the names of the 25 Analog Discovery 2 units. checking the 25 soldering stations and tinning the tips. soldering 25 pressure sensors onto breakout boards. packing everything into tubs that I can wheel to the other building on the cart. cleaning up the electrode holders that did not get cut cleanly by the laser cutter. getting reimbursed for over $3000 worth of parts and tools that I ordered for the students (UCSC can’t buy from AliExpress, and US vendors were over 3 times the price). But I think that tomorrow I’ll take a break—maybe even see if I can get anything working on the robot I didn’t finish for the mechatronics course. 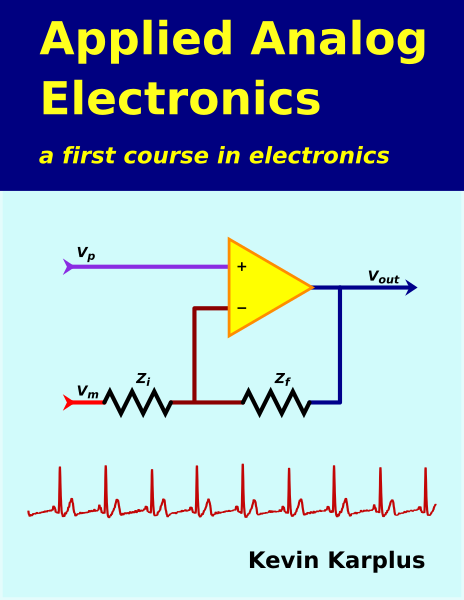 I’m not going to get rich off of this textbook, but I’m hoping that a few other teachers of electronics will pick it up and use it for a course. I’ve just finished doing a rewrite pass over the part of the textbook needed for BME 51A, which I’ll be teaching starting in January. I’ve been working on this rewrite pass since June, so a little over 4 months. I’ll be spending the next couple of months doing a rewrite pass for the part of the book needed for BME 51B, but that should go a little quicker, as there are about half as many pages in the second “half”, and I think they are in somewhat closer to the desired form than the part I just finished. There are still a lot of “to-do” notes in the margins of the book, even in the part I just “finished”, but they are all fairly small things, I think. This blog post will be my release notes for this version of the book, summarizing what I changed. The biggest change was a rearrangement of the order of the labs, so that there are now two amplifier labs in the first half, and all the audio labs are in the second half. Lots of things (like the table of equipment for labs and the schedule of lectures) needed to be revised to fit. I still have some work to do on the lecture schedule. I moved the sampling and aliasing lab after the thermistor lab, so that there is more time in lecture to talk about time-varying signals before the lab. I expanded the op-amp chapter into a more general amplifier chapter, and now discuss multi-stage amplification from the beginning, because the instrumentation amp lab for the pressure sensor is now the first amplifier lab. I also added active low-pass filters to the op-amp chapter. I rewrote the optical pulse-monitor lab, which now calls for a more robust design using logarithmic current to voltage conversion. I’m still experimenting with different ways of holding the phototransistor, so I may need to redo all the photographs, if I come up with a better design. The optical properties of blood section of the optoelectronics chapter now discusses melanin and fat, and the effect they can have on optical pulse monitoring. I added a new chapter on transimpedance amplifiers, and added log-transimpedance amplifiers to the chapter. The difficult sensitivity analysis for the pulse monitor has been removed, as the log-transimpedance design does not require great care in setting the gain. I added more coverage of expected background material, so that students who had not had physics electricity and magnetism courses could still follow along. I found that a lot of the students didn’t remember anything from physics anyway, so I had to cover the essentials over again, and so I reduced the prerequisites for the course to calculus and high-school physics. I also added a section on logarithms. I added a bunch more figures, bringing the numbered figures up to 145 (and several of those are multi-part figures). I also improved the typesetting of the captions, so that they are better distinguished from the main body text. Several of the block diagrams were redrawn with draw.io, and I added some new block diagrams and a bit more discussion of how to use block diagrams effectively. I cleaned up a few of the schematics also. I added a few more exercises, added autonumbering, and converted the somewhat vague prelab assignments into numbered exercises, so that I can assign blocks of numbered exercises without worrying that students may have missed part of the prelab assignment. The oscilloscope probe exercise that caused a lot of problems last year has been rewritten with more scaffolding. I added “equipment-needed” lists to the beginning of each lab. I changed some of the labs that had used potentiometers to sweep voltages to use function generators with a slow triangle wave instead. This should save quite a bit of time, particularly for the hysteresis lab, where I described how to trigger on the output of a Schmitt trigger changing to record the input thresholds. I created a new appendix for some of the PteroDAQ details, which I removed from the DAQ chapter. I added more index terms and fixed a number of glitches in the index. Index entries with subindexing now stay together in one column, rather than being split between columns and pages. I’ve started boxing “important” things (and I may change to highlighting them), but choosing the right things to box will probably take another full pass over the book. I fixed all the overfull-hbox errors through Chapter 24.